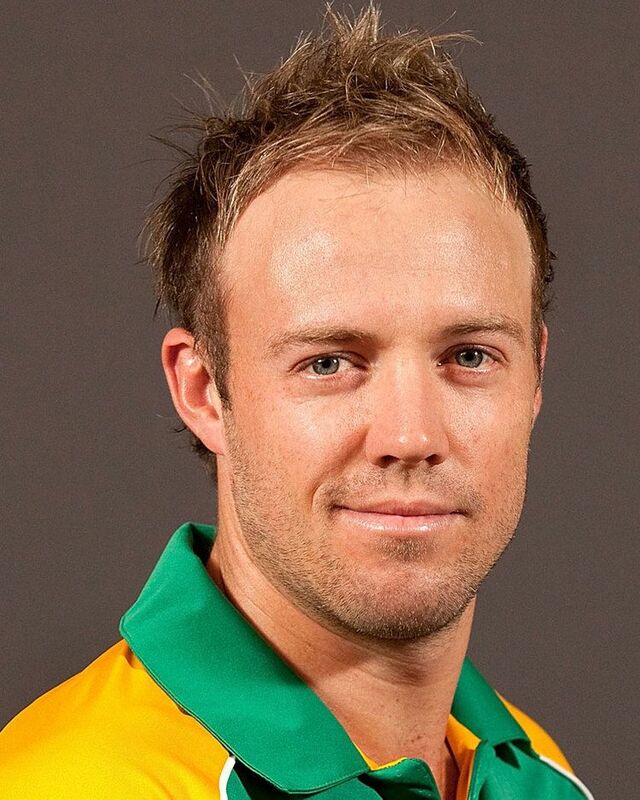 AB de Villiers (born 17 February, 1984) is a former South African cricketer, who plays all formats and also a former captain in all formats. He has been rated as the number one batsman in Tests and ODIs on several occasions. Often regarded as one of the best batsmen of his generation and also regarded as one of the greatest of all time, De Villiers holds many batting records, including the world's fastest ODI 50, 100 and 150, the fastest Test century by a South African and the fastest T20I 50 by a South African. AB de Villiers is also among one of the marquee players in T20 Global League. He began his international career as a wicketkeeper-batsman (returning to the role for a few years in mid-career), but has played most often solely as a batsman. He has batted at various positions in the batting order but predominantly in the middle-order. Noted as one of the most innovative batsmen in the modern game, De Villiers is noted for many unorthodox shots behind the wicket-keeper and slips, which earned him the nickname Mr. 360. He made his international debut in a Test match against England in 2004 and first played an ODI in early 2005. His debut in Twenty20 International cricket came in 2006. As of 2016, he has passed 8,000 runs in both Test and ODI cricket and has a batting average of over fifty in both forms of the game. De Villiers captained South Africa in all formats, but since his injuries, he stepped down from Test captaincy and continued in limited over formats. However, with defeats in 2017 ICC Champions Trophy and England series, he stepped down from limited over captaincy as well. De Villiers was born in Warmbad, and enjoyed what he later described as the "really relaxed lifestyle up there, where everyone knows everyone". He went to high school in Pretoria along with fellow teammate Faf du Plessis. They attended the prestigious Afrikaanse Hoër Seunskool. AB returned home for weekends. His father was a doctor who had played rugby union in his youth, and he encouraged his son to play sport; as a child, De Villiers played cricket at his home. His autobiography was published in September 2016. 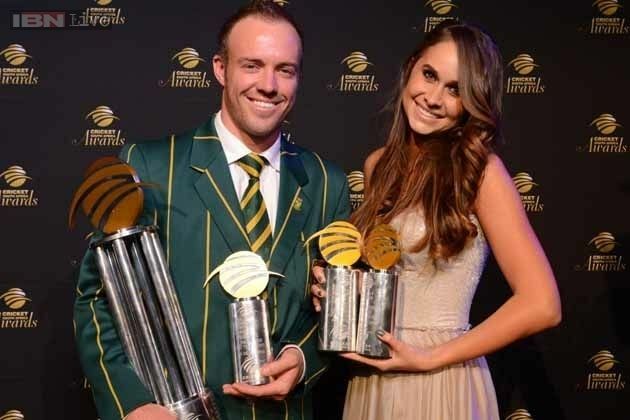 Beside cricket, De Villiers also excelled at golf, rugby and tennis in his youth. He has been involved in charity works. De Villiers is a right-handed batsman, who has accumulated over 8000 runs in Tests including 21 centuries and 39 fifties. He holds the record for most Test innings without registering a duck (78), before being dismissed for nought against Bangladesh in November 2008. 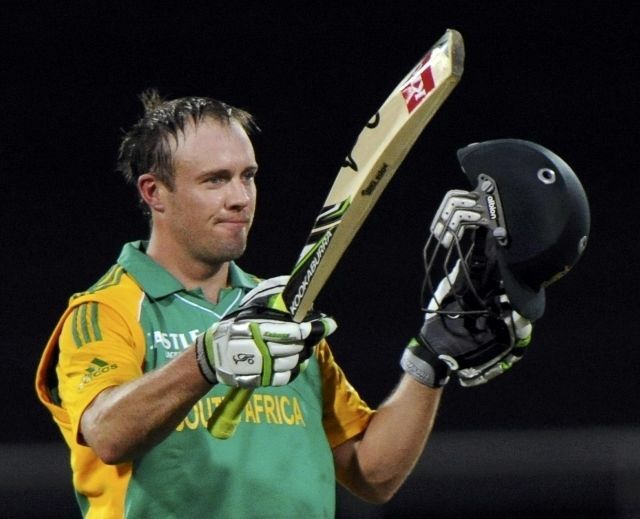 He also holds the second-highest individual score by a South African batsman, with 278*. 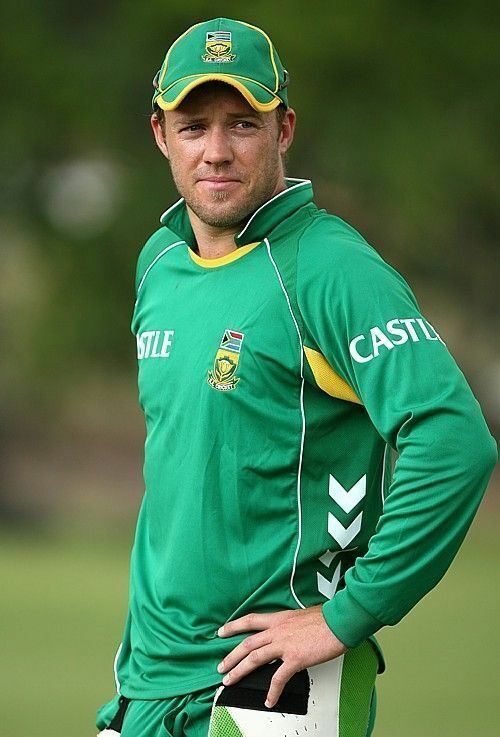 Until 2012 he was an occasional wicket-keeper for South Africa, although after the retirement of regular Test keeper Mark Boucher and under his own captaincy he has started to regularly keep wicket for the national side in Tests, ODIs and T20Is. He gave up wicket-keeping in 2015, after the debut of Quinton de Kock. He holds the records for the fastest 50 (16 balls), 100 (31 balls) and 150 (64 balls) of all time in One Day Internationals by any batsmen, and also holds the fastest hundred by a South African in Tests and the fastest 50 by South African in T20Is. He is the three time ICC ODI player of the year, winning the award in 2010, 2014 & 2015. He succeeded Graeme Smith after the 2011 Cricket World Cup for the ODI captaincy and Hashim Amla after the Second Test of the England in South Africa series for the Test captaincy. He stepped down from Test captaincy in December 2016 due an elbow injury which kept him out of the team for a long period. De Villiers became the second youngest and second fastest South African to reach 1000 test runs after Graeme Pollock. In his Test career so far has batted, bowled and kept wicket. Even though he excelled in other sports, he chose to pursue a career in cricket and, after a spell in the South Africa U19 team, he made his debut for the Titans in 2003/4. He also played for Carrickfergus Cricket Club in Northern Ireland as their overseas player in 2004. He made his Test debut as a 20-year-old on 16 December 2004 against England at Port Elizabeth. He made an impression opening the batting, but was dropped down the order for the second Test and also handed the wicket-keeping gloves. In this match, he made a match saving half century from number seven. However, he found himself at the top of the order again for the final Test of the series and has played the majority of his Test innings there. De Villiers has a reputation as an outstanding fielder, typified by a diving run-out of Simon Katich of Australia in 2006, when he dived to stop the ball, and while still lying on his stomach facing away from the stumps, he tossed the ball backwards over his shoulder and effected a direct hit. This has also led people to make further comparisons of him to Jonty Rhodes, who was also one of the finest fielders of his generation. On 6 June 2011, then S.A. coach Gary Kirsten announced that AB de Villiers will be South Africa's new limited-overs captain. "I'm very excited but I'm also inexperienced. But I've learnt a lot the last seven years from an unbelievable captain," said De Villiers, who had never captained a team at first-class level. "It's a big responsibility, but there'll be a fresh look in the side, which is good." In the early stages of the tournament his form was poor with three failures including a duck against the Netherlands in a match where his team broke various records for batting, although he scored a 92 in the first round against Australia. On 4 April 2008, he became the first South African to score a double century against India with his top score of 217*. De Villiers scored an obdurate 174 that helped set up a ten-wicket win for South Africa in the second Test against England at Headingley Carnegie in Leeds in July 2008. This was followed by a 97 at The Oval before he came down the wicket trying to smash Monty Panesar for a boundary and was caught on the fence . In the first Test in Perth, De Villiers scored a match-winning century to help South Africa chase down the second highest ever fourth innings target of 414 with six wickets in hand. This was South Africa's first Test victory in Australia in 15 years and appeared to go a long way towards tilting world cricket's balance of power after over a decade of Australian dominance. De Villiers also took four diving catches in the course of the match, including one to dismiss Jason Krejza, a stunner at backward point. De Villiers only scored 11 runs though in the second Test at the Melbourne Cricket Ground and made another low score in the first innings of the final Test at the Sydney Cricket Ground. In the second innings of that Test though, De Villiers scored a patient half-century as South Africa almost held on for an against-the-odds draw. In the first Test of the return series at the Wanderers Stadium, De Villiers provided lone resistance in the first innings against a bowling attack led by pace bowler, Mitchell Johnson, scoring 104* of 185 balls with 9 fours and 1 six, while his teammates all fell for under 50. But in the second innings he made only 3 off 7. In the following 5 game ODI series, De Villiers played consistently, although starting badly in the first game, scoring only 2 runs. However, he went on to make 36*, 80, 84, and 38 and was named Player of the Series at the conclusion of game 5. His major challenge came against Pakistan for the two Twenty20 matches, where he kept wicket. In the first match he was out for a second-ball duck off a superb delivery by Shoaib Akhtar. In the second T20I he scored 11 runs. He then participated in the five-match ODI series where South Africa were chasing 203 to win and he scored 51 before he was caught and bowled by Saeed Ajmal. In the second ODI he scored 29 as he was bowled by Shahid Afridi; in the same match a flamboyant Abdul Razzaq played the greatest innings of his life to lift Pakistan to an unbelievable victory. During the third match he scored 19 before he was stumped by Zulqarnain Haider. It turned out to be a mistake by the umpire as he had pressed the wrong button. In the fourth match he missed out on a half-century while on 49 when he gave his wicket to the fielder at point. His good form in the series continued when he scored 61 in the final ODI as South Africa won by 57 runs and the series 3–2. 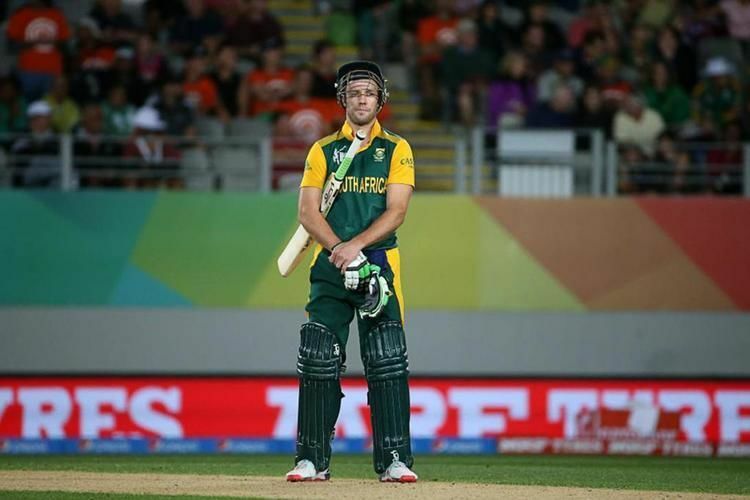 On 4 February 2013, De Villiers equalled Jack Russell's record of 11 dismissals in a match. He also scored an unbeaten 103 off 117 balls in South Africa's second innings of the same match. In the process, he became the first wicketkeeper to score a century and claim 10 dismissals in a Test. On 18 March, during the third ODI match of Pakistan's tour of South Africa at Johannesburg, De Villiers and Hashim Amla shared the record for the highest third wicket partnership in an ODI when they scored 238. De Villiers scored 12 fours and 3 sixes, and a total of 128. On 18 January 2015, De Villiers scored the fastest century by a batsman in One Day International cricket, off 31 balls and eventually scoring 149 runs off 44 balls in 59 minutes against West Indies. On 27 February 2015, De Villiers scored 162 runs off 66 balls in a match against the West Indies in Pool B of 2015 Cricket World Cup; leading South Africa to their second highest total in world cup history (408) on the Sydney Cricket Ground. With this feat, he became the record holder for the fastest 50, 100, and 150 in One-Day International history. Under the captaincy of De Villiers, South Africa qualified for the semi-finals of the World Cup but lost to New Zealand in the match. De Villiers finished the tournament as the third highest run-getter with 482 runs behind Martin Guptill and Kumar Sangakkara. On 21 February 2016, de Villiers scored the fastest T20 fifty by a South African in just 21 balls. He completed the innings at 79 runs in 29 balls and led South Africa to a clean sweep in T20 series. On 18 January 2017, De Villiers ruled himself out from most of the Test matches that South Africa is going to play in 2017. De Villiers completed 9000 ODI runs in 205 innings and 9005 balls; this set a new record in terms of innings taken to reach 9000 runs. He won the Man of the Series award in the series versus New Zealand. AB de Villiers is one of the most successful batsmen in the Indian Premier League. In the fourth season, he was contracted by Royal Challengers Bangalore for US$1.1 million. He played for the Delhi Daredevils in the previous seasons. He has been crucial to the successful batting lineup of the RCB. Fastest half-century (16 balls) and century (31 balls) in a One Day International (ODI), against the West Indies at Wanderers Stadium, Johannesburg on 18 January 2015. Fastest 150 in an ODI, in 64 balls against the West Indies at the Sydney Cricket Ground, Australia on 27 February 2015. Second fastest in the world to reach 8000 runs in ODIs. Fastest player to reach 9000 runs in ODIs (205 innings). He took only 9005 balls to reach the milestone, which is also the quickest of all. Most sixes (16) in an ODI (tied with Rohit Sharma and Chris Gayle), against the West Indies at Wanderers Stadium, Johannesburg on 18 January 2015. Most ducks (4) in an ODI series, at the 2007 Cricket World Cup (tied with Greg Chappell and Kyle McCallan). Most sixes (37) at the Cricket World Cup (tied with Chris Gayle). Both AB De Villiers and Virat Kohli were the second pair of batsman in T20 history to score centuries in a single T20 in IPL 2016 against Gujarat Lions. Most Test innings (78) without registering a duck. Scored all his 24 ODI Centuries at strike rate greater than 100. Leading run scorer for South Africa at the Cricket World Cup. Fastest T20I fifty by a South African (21 balls). Joint slowest T20I fifty by a South African (49 balls). In 2015, he and his wife Danielle had their first baby, a boy who was also named AB. He is a devout Christian and has stated that his faith is crucial to his approach to life. He is also an accomplished guitar player and a singer. In 2010, he released a bilingual pop album entitled 'Maak Jou Drome Waar' with his friend and acclaimed South African singer Ampie du Preez. He is also a self admitted Manchester United fan, having followed the club since Ryan Giggs' debut.